More than 3,000 children under the age of 15 are sent to the emergency room each year in the United States because of fireworks. 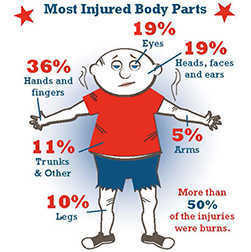 Children younger than 15 account for 4 out of 10 fireworks-related injuries, and a quarter of the injuries happen to children who are bystanders. Even if you do not allow your children to touch fireworks, they can still be seriously injured if they are around others who are using fireworks. Sparklers, which are typically viewed by parents as relatively harmless fireworks for children, account for one-third of the injuries to children under five. Sparklers burn at approximately 2,000 degrees Fahrenheit, which is hot enough to cause third-degree burns. Children should never handle sparklers. Let young children use glow sticks instead. They can be just as fun but they don’t burn at a temperature hot enough to melt glass. The best way to protect your family is to not use any fireworks at home. Instead, attend public fireworks displays and leave the lighting to the professionals. If a child is injured by fireworks, immediately go to a doctor or hospital. If an eye injury occurs, don't allow your child to touch or rub it, as this may cause even more damage. Also, don't flush the eye out with water or attempt to put any ointment on it. Instead, cut out the bottom of a paper cup, place it around the eye, and immediately seek medical attention — your child's eyesight may depend on it. If it's a burn, remove clothing from the burned area and run cool, not cold, water over the burn (do not use ice). Call your doctor immediately. Never allow children play with or light fireworks. Keep a close eye on children at all times when around fireworks. Also, be aware that many injuries happen days before or after the 4th of July. Never try to relight "dud" fireworks that have not fully functioned. Wait 15 to 20 minutes and then soak it in a bucket of water before disposing of it. Keep a bucket of water, fire extinguisher, and/or a garden hose handy in case of fire or mishap. The lighter of the fireworks should always wear eye and ear protection and never have any part of the body over the fireworks. Use long match sticks to light the fireworks, not lighters or cigarettes. Never light fireworks in glass or metal containers.